Joseph S. Mella, Director of Vanderbilt University Fine Art Gallery, Nashville, Tennessee, USA. The exhibition features the works of 39 artists from the United States, Canada, Australia, Brazil and Greece, including : Pamela Stratton from Rockport MA. 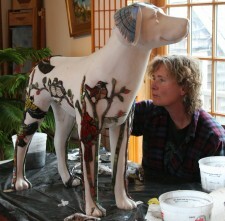 Pamela is a member of the Cape Ann Artisans and the Rockyneck Art Colony in Gloucester Ma. She mantains a mosaic studio in Rockport and teaches mosaic classes year round. I am offering open studio time for students who have attended my workshops to come and work on their own projects. I will provide tools and adhesives. You are encouraged to bring your own mosaic materials if you have them. Bringing your creative spirit is required. I am offering 2.5 hour time slots for $35. In this one day workshop you can choose to work with Smalti or Stone or mix it up and use both. We will make a 6×6 or 3×12 mosaic in the direct method. Learn how to use B cuts and larger pieces of smalti and stone to add interest to your work. Students will have the opportunity to see how to use the hammer and hardie to shape and texture larger pieces of smalti. Hammer and hardie are available to students with experience using these tools. Feel free to bring a special stone or object to add to your work. Marble, smalti, glass rods, pebbles and shells are provided. Beginners are welcome. All materials and a lovely lunch are provided. Want to start using the hammer and hardie to expand your mosaic making potential? Learn about choosing the right hammer. Try out different weights to see what works for you. Learn the proper technique for working with both marble and smalti. If you already have a hammer, please bring it. 4 students max. $95 including use of tools and materials. Play with texture and color while focusing on the fundamentals of mosaic making. Cut a variety of materials using nippers to create a vibrant 6 x 6 smalti mosaic. Hammers and hardie are available for more advanced students. Work directly with thin set mortar to adhere a variety of tessera, smalti glass, pottery shards, marble or perhaps a special treasure you have been saving. Open to any level of experience. Many wonderful Inns are within walking distance. For those who would like to learn to work with or continue to explore and play with this fabulous material. Smalti is the beautifully colored glass seen in the mosaics of the great cathedrals throughout the world. Smalti is hand cut from a large slab or pizza of glass. Its riven edge is used as the surface giving the mosaic a sparkling, reflective quality. 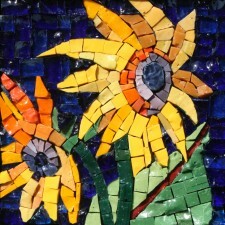 The class will focus on the fundamentals of working with Smalti to create a vibrant, colorful mosaic. Learn to break pizzas, chop and chip B-cuts to add interest to your mosaic.The studio has a large selection of colors and materials to chose from. Use of the hammer and hardie will be demonstrated and are available to use. We will make a 6×6 ungrouted mosaic using the direct method. You can use a variety of materials: vitreous glass, stones, found objects you have collected, pottery, minerals, marble or ceramic porcelain tile to make an 8×8 grouted or non grouted mosaic. Grout date will be determined in class. All materials, and choice of a few designs will be provided if you do not have a plan of your own to allow you to use your newly acquired techniques and skills. Create a beautiful piece of art for your garden or home. I have granite cobbles that have a carved out oval center approximately 7.5 x 5 inch. We will work directly using thinset mortar so your cobble will be safe to place outside year round. It can be great to look out into the Winter garden an see a colorful mosaic nestled in the snow! Thank you so much! Thanks for your patience,your wonderful organized day and your guidance. I loved the great al fresco lunch. Thank you for your wonderful Smalti class. I learned so much! You're a natural-born teacher. And I have a really cute mosaic to remember it by. I just wanted to thank you for a truly inspiring workshop. Just want to thank you again for all of your help with my first mosaic project. So much to learn! Your workshop was very informative and planned well. It was really nice to be able to complete our projects in that one session. And the lunch was especially good!